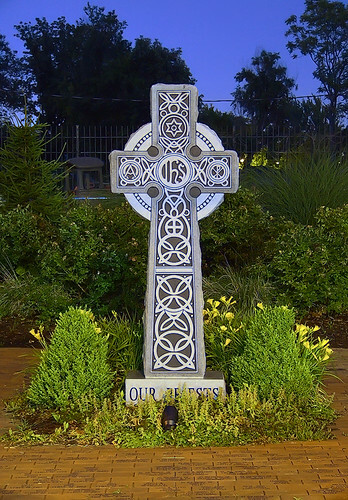 Celtic cross monument at Saint James the Greater Church. Modeled after ancient Irish crosses, this also includes Greek letters of the name Jesus Christ, as well as Alpha and Omega: beginning and end. At the base, obscured by vegetation, it reads "OUR PRIESTS". Surrounding the cross are bricks inscribed with names of church patrons and memorials. Although technically in the Clayton neighborhood of the City of Saint Louis (as distinguished from the City of Clayton in Saint Louis County), this neighborhood is almost universally called 'Dogtown'. The church is the focal point of an annual Saint Patrick's Day parade.